An unparalleled figure in Finnish choral music, Matti Hyökki led the YL Male Voice Choir as conductor from 1980 to 2010, with many international accolades along their way. He was also chorus master of the Finnish National Opera from 1992 to 1995. Having earlier completed diplomas as church organist and music teacher at the Sibelius Academy, he became in 2003 the first graduate in Finland of a doctoral degree programme in choir conducting, with YL as his instrument. 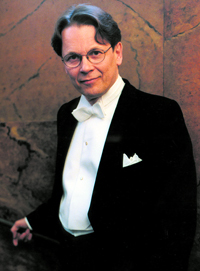 Since 2007, Matti Hyökki has been Professor of Choir Conducting at the Sibelius Academy. He is a regular jury member at international choir competitions and has conducted numerous international choir workshops.